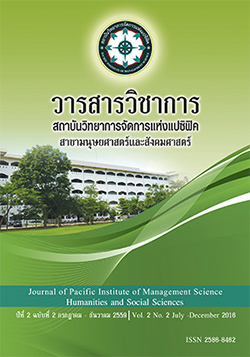 The research entitled, “Participatory Academic Affairs Management Model ofGeneral Education Division inPhraPariyattitham Schools in SakonNakhon”, aimed 1) to study the state of the participatory academic affairs management ofGeneral Education Division inPhraPariyattitham Schools in SakonNakhon Province, 2) to create the participatory academic affairs model ofGeneral Education Division inPhraPariyattitham schools in SakonNakhon Province, and 3) to evaluate the participatory academic affairs model ofGeneral Education Division inPhraPariyattitham schools in SakonNakhon Province. The samples used in the first period of this research were 56 administrators and teachers who were teaching in 7PhraPariyattithamschools of SakonNakhon Province in the academic year of 2014. While in the second period of this research, the 9 informants were invited to participate in a focus group discussion. And in last period, the 20 experts were invited to be as the informants for evaluation. The state of the participatory academic affairs management of PhraPariyattitham Schools in SakonNakhon Province were at high level. Especially, the instructional media aspect was at the highest level; the curriculum and curriculum management aspect was at the lower, and the lowest level was the internal supervision aspect. The participatory academic affairs model of PhraPariyattitham schools in SakonNakhon Province consisted of 2 variables that were relevant to each other, i.e. the 5 aspect-participatory principles and the 5 aspect-participatory academic affairs of ofPhraPariyattitham schools. The results of evaluation for the appropriate and possible participatory academic affairs model of PhraPariyattitham schools in SakonNakhon Province overall were at the highest level.